This awesome picture was created by a special friend ~ her words…”our prayers need to be constant like the tides”. Thank you Lori for the picture….for the thoughts …. for the prayers. We have noticed something new Rylan is doing. Tracing. Everything. From letters on pages to the carvings in my dining room chairs to the lines on Pa-pa’s face. He is tracing the imprint—-the impression made by something else that has forever changed the image. That is what prayer does. It changes things. It changes hearts, touches lives. Prayer moves the heart of God into action. Not that His heart is ever inactive. It’s not. His heart is always moving, feeling, loving, in action. But when He sees His children on their knees on behalf of another, all of heaven is moved. It is a selfless act of humbling ourselves down to go before the Father for “someone” else. Sometimes we don’t want to “bother” someone else with our needs. We feel they have enough of their own. But the Lord instructs us in His Word “Pray one for another” James 5:16 “Confess your faults one to another, and pray one for another, that ye may be healed. The effectual fervent prayer of a righteous man availeth much”. I began to call on friends and extended family for prayer when Wanda became so sick in December. Pride kept me from calling on them sooner. But when the Doctors report came back with such negativity….I felt like pride was no longer an issue. It no longer mattered what I may look like. No sooner had Wanda gotten home from the hospital when the enemy struck in other areas of our lives. Through other circumstances and family members lives. I ask myself, what is up? What is going on? Haven’t we had enough trouble? Vicki, I so agree with your thoughts “Friends, we need grace to stand in these difficult times, but this grace is not something God dispenses apart from Himself. The Lord Jesus Christ IS grace – and we experience Him all the more as we continually let Him renew us inwardly in His Word daily”. My heart aches with the needs of my friends and family. My heart aches for those I have never met, but feel such a bond like I cannot believe could exist. My answer? Prayer. In the times of trials in my life…I can only tell you relief and answers came only after my face was to the floor on behalf of the one in crisis. Only then did I have peace in my heart—-once I had completely surrendered to the Father. On the altar. On the days when my heart and mind was so muddled I couldn’t make a complete sentence —- or so I thought—God could take all of that with my tears and answer a prayer. He could give peace to the muddle-minded-me. I have put out a unusual request to some of my friends and family that I knew had a need in their life—or if I felt the Lord direct me, for their handprint. In a conversation with my sister Aimee last week we have been talking a lot about the urgent need for prayer for some family situations. I BELIEVE God can do miracles. I sat beside one such miracle Sunday. Her name was Wanda. Yes, my sister Wanda sat beside me —- sisters—–without her oxygen. (Go back and read my post on Sisters of Faith where the doctors said she would always need it!) Can I get a GLORY HALLELUJAH! Some of you don’t know what we faced with her. But that’s okay. You don’t have to know the whole story….just know that God has brought my sweet sister from the door of death back into life. God is not finished with her! The doctors just “thought” she was done. NOT. We have some more situations in our family that are urgent. We have some situations in our district and churches that are critical. God is on His throne–He knows and sees exactly what is going on….even in the heart. He has not been on a snow-skiing vacation or a cruise! He’s right there—here—where you need Him. Where I need Him. I know there are some needs in our circle of bloggers. God is ready. Able. We are praying. We are believing. What Aimee and I are doing with our family is tracing (or having them do it if they don’t live near enough to visit) their hand print. Simple, old fashioned, much like your mom may have done to entertain you while you were in church. On white copy paper with a pencil. Or it can be scanned and e-mailed in. We are writing their name, and for our benefit the “specific need” and date. We are keeping these in a book that I’m calling “my prayer book”. No it’s not magical. No, it doesn’t mean anything weird. But I can’t go to them to pray with them, so this will be my point of contact and my reminder of them. 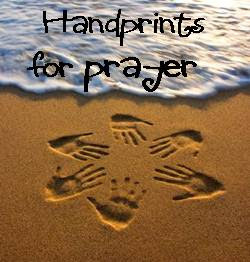 I have asked some friends for their hand prints as well, so that I can have a point of contact to pray. This idea came when Aimee remembered that when Emilie Barnes was sick with cancer, she traced off her hand and put it on her website for her readers to copy and pray. I believe in the power of prayer. Not in the power of paper hands. But the power of the Blood of the Lord that was shed for you and me….for by His stripes we are healed. 1 Peter 2:24 “Who his own self bare our sins in his own body on the tree, that we, being dead to sins, should live unto righteousness: by whose stripes ye were healed”. No matter the conflict arising in our families…prayer can change things. She also reminded me of the verse “Wherever two or more are gathered in My name there I will be” (Matthew 18:20) So, sisters, gather in the hands of your family members—near and far—and pray. This entry was posted on Monday, January 28th, 2008 at 2:26 pm	and posted in Country Life Messages. You can follow any responses to this entry through the RSS 2.0 feed. I’m with you, Angie! One thing I’ve observed over the years is that we are such an ‘instant’ society are prayers have even become instant. So many don’t know how to be persistent in prayer. Some tire of a prayer request because it’s ‘not answered’ yet. Persistent, perservering prayer is what storms the gates of heaven. A one time prayer for a situation that needs ongoing intercession is like throwing a pebble at the gate and then wondering why He doesn’t answer. our God is a God of miracles. nothing is impossible and nothing is to hard for Him to do. prayer of the saints can move mountains. Ah, beautiful spirit Angie!This post made me cry. You are right about the need for prayer and your examples and faith have touched me. Touched my heart to draw closer to Him.Bless you! We must carry this prayer banner high and stretch it out wide. Words fittly spoken, Angie. I’m so thankful we can have the liberty to pray anytime and any place. Holding your hands in prayer, love you!